The Scorpio comes with two variations of Central Locking. The lower specified system utilises traditional direct methods. The higher specified system uses “Global Closing”. This system uses a bus topology to control the locking system and other features such as power windows, sunroof and seating. On the Global Closing variation, the locking can be deadlocked by a second operation of the Key Fob Remote or actuation of the Key Lock; this also arms the Ultrasonic Interior Alarm Sensors when fitted. After arming in this way, the system flashes the indicators within a few seconds to acknowledge that the alarm has adjusted to the cabin and has armed. This may not apply to all vehicles as this behaviour is modified between markets. However neither system provides an audible indication that the locks have operated. The mechanical noise from the locks is low and I found it difficult to fully be sure the car was locked without actually visually checking, or deadlocking the car and waiting for the indicators to flash. So it was decided to add some method of audible feedback. With the traditional system, adding a system to detect locking would be straight forward, however I have the Global Closing system. One option would be to actually get at a lock motor and break into its feed, however this is complicated by the fact that this would have to be done inside the door skin, as the feed to the locks is shared with other modules within the door. More sophisticated, would be to monitor the bus, decode the signals and initiate a signal this way. However this was going to be reasonably time consuming, and would involve interfacing to the bus. I felt that it would be preferable to keep the system to original specifications. The third method considered, was monitoring the current flowing to the locking system, this was the method chosen. The system is passive in its connection to the locking system and should work on any Scorpio. It was decided that the system should be easy to fit into the car, i.e. no major wiring or removal of components. From this the design developed, of a plug in circuit, which sat in the Main Fuse Box. A printed circuit board was designed for the system, this fits into the fuse box, Fuses 22 and 21 are removed and the board piggybacks into the fuse holders in the fuse box. Fuse 22 is the locking system fuse and Fuse 21 the heated mirror fuse. The operation of the circuit is as follows. When the locking motors are activated the current flowing through the circuit that Fuse 22 protects increases considerably, than the level at standby. An isolated Current Transducer, CT1 is used to measure this current. CT1 provides an analogue output dependent on load current. This signal is fed to a small microcontroler that has an internal analogue to digital converter built in. From this the microcontroler decides if the locking motors are activated. 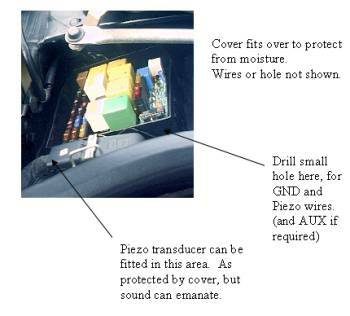 Additionally the way that the Heated Mirror circuit within the Scorpio is designed, no voltage appears on Fuse 21 the mirror fuse, until the Heated Rear Screen Switch is activated. This gives a method of signalling the system if required. If the system decides that the locks have been operated, it produces a 4.5Khz signal that is sent to a piezo transducer, also an auxiliary output is switched on and off. The auxiliary can be used to drive an external relay, as to provide indication through the horn or headlamps if required. Some experience with soldering is required to construct this project, that said it should be reasonably straightforward. The p.c.b. is a double sided through hole component, with silkscreen and solder resist, this makes assembly easier. The silk screen shows component identifications, these correspond with the schematic. It is recommended that the resistors are fitted first, followed by diodes, capacitors, transistors, resonator, IC socket and voltage regulator. Lastly the fuse holders and then, the following connector details. Quantity Description Vendor Part No. I used Farnell Electronics for the parts. Some components are only sold in multipacks by Farnell, Maplin Electronics etc can supply some components listed in smaller quantities but the Current Transducer and Resistor Equipped Transistors may be difficult to source elsewhere. 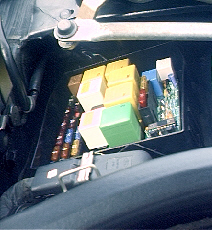 Assembly is straight forward, however the most time consuming part is constructing connections to plug into the existing fuse holders, in the Scorpios Main Fuse Box. Large currents can flow in these circuits, so care must be exercised. The specified PCB mounting fuse holders are rated at a continuous current of 15A, this becomes a possible problem as the door locking circuit is protected by a 20A fuse. In tests nothing like that current is used by the locking motors. In extreme conditions, mechanically jamming locks or frozen up locks, these currents possibly could flow for a brief period. The specified fuse holder will handle this for some time. If in doubt use a 15A fuse in place of the 20A, if you have no problems with it blowing. The connections to the power circuits, i.e. fuse 22 and 21 must be suitably constructed, as so to handle these currents. The method I chose is shown in the following pictures. I originally was going to have connections CNC’d and tin-plated, however time did not allow. I think some one else can come up with a better method. One list member at least is looking at this. Use faston spade connectors of the medium general size as used on car radio speakers, available from Motor World/Halfords etc. They come with a plastic sleeve, the colour of which identifies the designed cable diameter and current rating. Use ones with a red sleeve. Strip some 2.5mm electrical wire (twin and earth) and prepare a striped core, by cleaning it until bright, use a needle file etc, never wire wool as it contains oils. The PCB has slits, so designed for a CNC’d assembly, they do not centre with the fuse holders as they are. Refer to the picture above. Remove sufficient solder resist from the top of the board around the area to be soldered to. Once you are sure about the alignment, if necessary open the slits at the required positions slightly, I used a few turns of a round needle file. Solder in 4 lengths of about 25mm, you need a soldering iron that can do at least 30W if you want good results. Ensure the joint is sound, inspect carefully. You do need some experience with soldering to do this correctly. Once cooled down place a faston spade, with its outer sleeve in place, over the wire on the solder side of the board. Very carefully solder the crimp to the wire, you need to provide the heat for at least 8 seconds until capillary action draws sufficient solder into the crimp. The crimp needs to be filled with solder. Carefully, mind your fingers, before the crimp has cooled completely; use a pair of pliers to pull the still malleable sleeve up and off. Leaving the sleeve in place until this point, levels the connection at the correct height. Repeat until all four connections are in place. The use of copper wire provides some “adjustment” if your alignment is slightly out. The low power connections consist of, GND, outputs to the piezo and AUX. 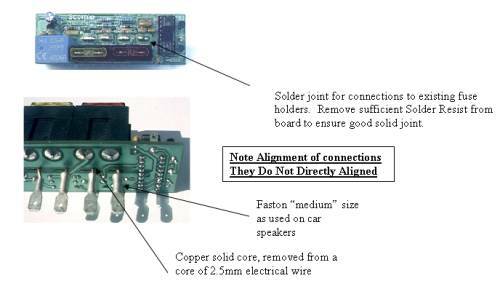 Thin wire can be used here, the board has provision to mount small faston connectors for these connections, or solder the wires directly into the board. The specified transducer can provide considerable noise output. For best results place a 1K 0.25W resistor in parallel with it, near to its leads. I used a Microchip PIC16C71, microcontroler. This device comes in two basic flavours, the one time programmable or otp and the EPROM type. Other devices could be used including possibly AVR products from Amtel. The original software is very basic and does not make use of all the possible features. I used a C compiler for speed and the relevant source code and hex files are included in awd.zip, so you can program your own devices if you have access to the facilities. RB1 can be used to detect when rear screen heater is pressed, could use combination of pushes on this to enter program mode etc. (not done this yet, in software). RA0 can be used to monitor battery voltage, this again has not been implemented in code. But all the hardware is on the board. A limited number of pcbs are available, as a reasonable batch had to be manufactured for minimum quantity reasons. These are available to interested Scorpio owners. The PIC16C71 is available ready programmed with the basic original software. No warranties or guaranties are given; no responsibility for damage is taken, for use of this design. It is provided purely for diy use and you are responsible for its use and integration. All details, source code etc can be freely used and modified for non-commercial purposes.